Welcome One and All to the NEW WrestleCrap.com! - WrestleCrap - The Very Worst of Pro Wrestling! Why hello there, Fellow Crappers and welcome to the brand spankin’ new WrestleCrap.com! Yes, after years of hearing how the site looked like something on Geocities, we have finally updated it to something a bit more modern…hope you like! But it’s not just the look of the site that has changed. Sure, all your favorite columns, such as It Came from YouTube, Someone Bought This, and Rewriting the Book are still here and being updated. Headlies are back, and in more abundance than ever. And, yes, our world famous Inductions that have been the cornerstone of the site since its inception nearly 13 years ago are being penned. There is also so much new for you to explore…like the new RD & Blade Show, featuring former WrestleCrap Radio frontmen RD Reynolds and Blade Braxton. Blade is also set to unveil the Parts Unknown Yearbook. What is it? One way to find out! 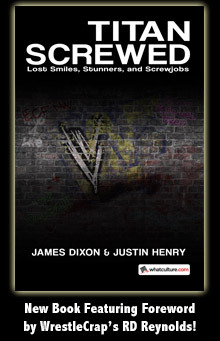 Our new Event Center is also here, featuring Justin Henry and the gang reviewing Raw, PPVs, and…Saturday Morning Slam?? Uh huh! And more new stuff like Power Crappings, the Curtain Jerker, and rants a plenty! Oh, and let’s say you want to comment directly on the different pages? Now you can! Just scroll down to the end of the post, and you will see an area to do just that. And remember how we used to update the site every Thursday night? Those days are gone. Now WrestleCrap will be a living, breathing, updated way too frequently monster! You’ll want to check back often, because you never quite know what may be posted on any given day. Most importantly, though, is our greatly expanded writing team. No longer is it just RD, Blade, Jed, and Justin. Sean Carless is back, and we’re also pleased to announce that Botchamania’s Matthew Gregg is has joined the crew. Add in our crack new team of Art 0 Donnell, Filthy Ape, Paul Kraft, Emerson Witner, Michael Dunlap, Travie Yak, Jordan Mishkin, Shane Jeffries, Avi Krebs, Henrik M, and CG Scum and you should be entertained for years to come. So come on in, kids – but wipe your feet. You’ve just stepped in WrestleCrap! 11 Responses to "Welcome One and All to the NEW WrestleCrap.com!" Great stuff! Will there still be Classic Crap postings? Been waiting for this. The site looks good. Botchamania meets Wrestlecrap? Truly, my prayers have been answered. This is like a Reese’s Peanut Butter Cup wrapped in bacon! Wow, looks pretty snazzy! Congrats on the unveiling! Been waiting for this. Looks good so far, can’t wait to see all the new stuff, as well as old favorites. Botchamania has joined forces with WrestleCrap? I like the new content, however, I must say the website’s new design reminds me of Cracked, and not in the good way. I actually preferred the “GeoCities” look, but maybe that’s just because of being used to it for so many years. I will say, I’m glad Maffew is on here! Always been a FAN of him and The Crap. Great news about Botchamania being on board. Maffew’s a good guy. 🙂 As for the site itself? Uh…looks…wordy? 😉 I miss the color and images of the old ones, especially the images. This is like wall to wall text in comparison. Not even any preview thumbnails or anything. That might cut down on views, no?